Hera and Ezra feature in a new 'Star Wars: Rebels' season three clip which shows Hera find an important family heirloom. On the surface this clip doesn't add anything new in terms of 'plot' to the story of the episode, as we have already seen two previous clips of Ezra dressed in scout trooper armour and the painting of Hera's family. Hera doesn't want to talk to Ezra about her family's past and I think this will be something that Hera has to confront - her family's past. I imagine Thrawn will induce, and perhaps coerce, Hera into talking about her childhood and how her background has helped shape who she has become. 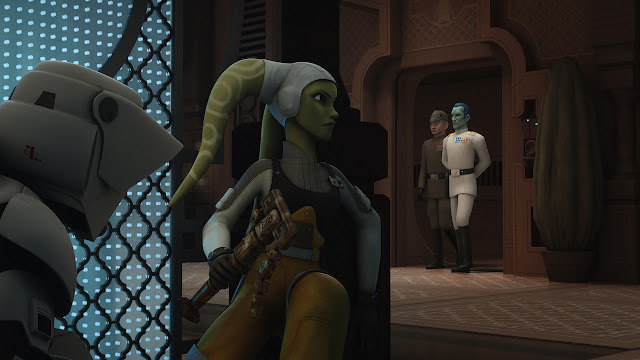 Star Wars Rebels returns tomorrow at 8:30PM EST with the episode entitled 'Hera's Heroes'.